The last trading week of April started from the strengthening of the U.S. Dollar and cryptocurrencies and the weakening of gold. At this point, the USD index has gained up to 90,38 points (+0,07%). The US Dollar has been supported by higher U.S. T-bond yields. For example, the 10-year and 30-year T-bond yields gained 2,6% and 1,6% respectively and increased up to 2,977% and 3,158% respectively. The U.S. Dollar has also been supported by the news about lower geopolitical tensions. North Korea is reported to have started phasing out the nuclear program. At the same time, the cryptocurrency market cap nearly hit 400 billion dollars this morning. All of the TOP10 coins have been going up in value. 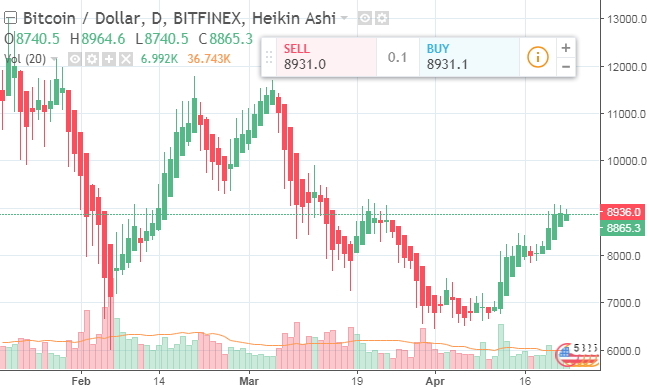 Bitcoin exceeded 8900 USD/BTC. For the sake of comparison, a week ago, the exchange rate used to be below 8000 USD/BTC. 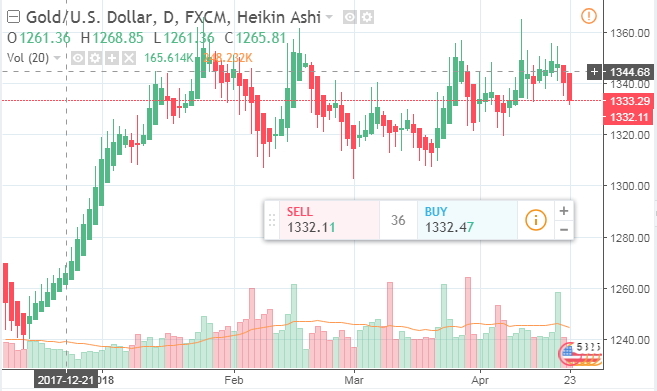 Bitcoin Cash showed even more strength by reaching 1370 USD/BCH. This was a 19% gain in 24 hours. By the way, BCH has been going up in value for 6 trading sessions in a row. Bitcoin Cash used to be undermined seriously. In January and February, it dropped by almost 40% and 20% respectively. Yet, another major drop by almost 50% took place in March. FortFS experts recommend that we hurry up with investing in cryptocurrencies since new money has been poured into the market. At the same time, gold has been going down against a stronger dollar. The Comex gold futures for June delivery dropped by 0,19% down to $1335,9/oz. Silver depreciated as well. The corresponding silver futures for June delivery dropped by 0,48% down to $17,8/oz, NordFX experts reports.